Mercury is a tough planet to study, being difficult for both naked eye and telescope viewing. It's also surprisingly problematic to send spacecraft to, which is why it has only ever been visited by two robotic space probes. A couple of weeks ago a new spacecraft was launched on a mission to Mercury. Called BepiColombo, it's actually two probes. They will travel together for seven years, then separate and begin their respective missions when they reach the small rocky planet in 2025. One probe, built by the European Space Agency, will study the surface and internal composition of Mercury. The other probe, built by the Japanese Space Agency, will study the magnetic field around Mercury. 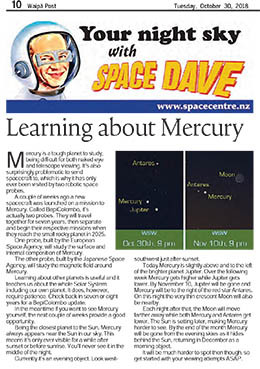 Learning about other planets is useful and it teaches us about the whole Solar System including our own planet. It does, however, require patience. Check back in seven or eight years for a BepiColombo update. In the meantime if you want to see Mercury yourself, the next couple of weeks provide a good opportunity. Being the closest planet to the Sun, Mercury always appears near the Sun in our sky. This means it's only ever visible for a while after sunset or before sunrise. You'll never see it in the middle of the night. Currently it's an evening object. Look west-southwest just after sunset. On October 30th Mercury is slightly above and to the left of the brighter planet Jupiter. Over the following week Mercury gets higher while Jupiter gets lower. By November 10th, Jupiter will be gone and Mercury will be to the right of the red star Antares. On this night the very thin crescent Moon will also be nearby. 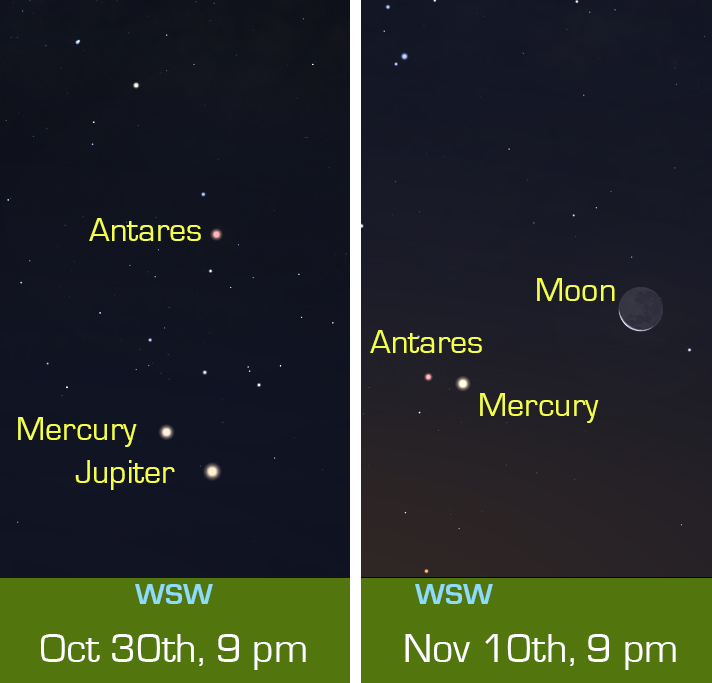 Each night after that, the Moon will move farther away while both Mercury and Antares get lower. The Sun is setting later, making Mercury harder to see. By the end of the month Mercury will be gone from the evening skies as it hides behind the Sun, returning in December as a morning object. It will be much harder to spot then though, so get started with your viewing attempts ASAP. Important safety tip for telescope and binocular users: Wait until the Sun has completely set before trying to look at Mercury because catching the Sun will damage your eyes.